When you already live in paradise, where do you go on vacation? 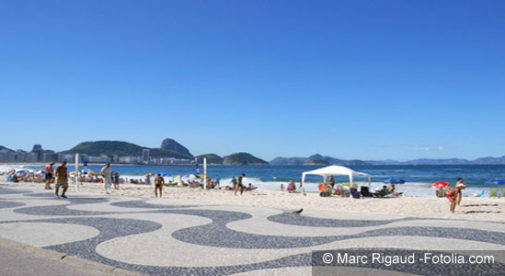 Cariocas, the laid-back residents of sensuous Rio de Janeiro, welcome 1.5-million vacationers a year. But when it’s time for their own vacations, here’s where they go: Many Cariocas have vacation homes in Saquarema (pop. 70,000). Its main natural attractions are Itaúna beach and Saquarema lagoon, which lies parallel to and very near the shore. Fishermen ply the lake, while small boats skim across its calm waters. In contrast, high waves crash onto Itaúna beach all year round, making it one of Brazil’s top surfing destinations. It is frequently the venue for surfing competitions. Brazil’s national volleyball team trains in Saquarema. You can see some world-class players practicing and competing. Beach volleyball is also extremely popular with amateurs. The most popular tourist stop is the Nossa Senhora de Nazareth church, located atop a hill with sweeping views of both the ocean and the lagoon. It’s a great place to watch the sunsets. Afterwards, people congregate at the town square to eat, drink, and dance. The local government organizes concerts in the summer (December-February), featuring top Brazilian artists. Saquarema becomes very crowded in the summer and on holidays. 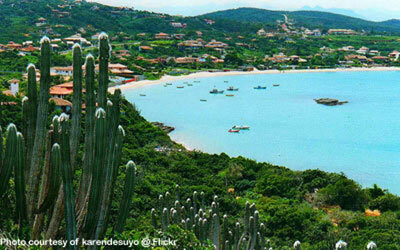 Arraial do Cabo is a fishing village, with fewer than 30,000 inhabitants. 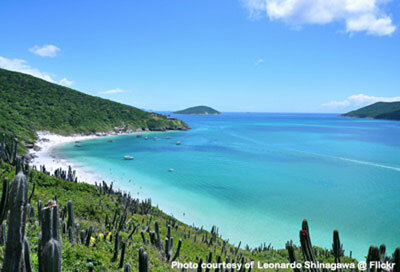 But sleepy Arraial is the gateway to boat tours that will thrill even the most jaded travelers. This area also has the best diving in Brazil, second only to Fernando do Naronha National Park in the northeast. Purportedly 88 wrecks can be dived in Arraial’s immediate area. Boat tours are very reasonable, at $20 to $25 per person, including water, soft drinks, and snorkel gear. As you leave the harbor, glance back. You are looking at a landscape little changed since Amerigo Vespucci sighted this coast in 1503 and left a contingent of men behind. That’s right: Diminutive Arraial is one of the oldest settlements in the western hemisphere, predating Jamestown, Virginia, by more than a hundred years. It’s impossible not to succumb to the incredible beauty of the sea here. Deep cobalt waters quickly give way to incredibly clear and piercing turquoise shallows. As your boat strains against the current just outside the maw of A Gruta Azul (The Blue Grotto), you truly feel the inexorable power of nature. Before Brigitte Bardot and her Brazilian boyfriend “discovered” Armação dos Búzios in the mid-1960s, it was just another sleepy fishing village. “Búzios,” in fact, means “conch.” Today, Búzios is featured prominently in every guidebook. It is très chic—and très expensive. While the high prices and seasonal inundations of tourists will discourage most from living here, it is a lovely place to visit. The town has an Old-World feel to it. There are more than 20 beaches ringing the peninsula. It’s a favorite destination for couples.The town proper stretches along two streets, Rua das Pedras and the parallel Rua Turibio de Farias. Here you’ll find fine dining, chic shops, and European-style pousadas (small hotels, often family-run).While it’s delightful, you can easily do the circuit in a couple of hours. The days should be devoted to Búzios’s many beaches, each lovely, each distinctive—and each more difficult to find than the last. I strongly recommend hiring a local car and driver to find them all. Learn more about Brazil and other countries in our daily postcard e-letter. Simply enter your email address below and we’ll send you a FREE REPORT– The World’s Best Beachfront at an Affordable Price in Brazil. This special guide covers real estate, retirement and more in Brazil and is yours free when you sign up for our postcards below.